How do you tell a great story with a game? The answer lies not in the plot and dialogue, but in the very structure of the game design itself. In this article, we talk about why storytelling needs to revolve around the interactive nature of the medium. Come and learn how to identify great game narrative, and to understand the importance of interactive — rather than cinematic — storytelling. Imagine one day you are struck with a flash of inspiration: freshly seared onto your mind is a story, one that is undoubtedly the greatest tale ever conceived by Man. It has all the elements of a great narrative: a gripping plot, nuanced characters, and an evocative setting. How would you write a book to convey this story? First, let’s look at how the medium of literature works. Writers use words to express ideas, arranging them in ways that draw the reader into the world of the story. Writers use descriptive language to evoke the senses; they construct dialogue to reveal personalities; and they structure words into sentences, paragraphs, and chapters, to set the pacing and flow. You continue to churn out the whole book in this horrible style, somehow still managing to communicate the bare facts of the amazing story you had in mind. People who read the book would laugh. Even though it may actually contain the outline of an amazing story, it fails to properly put it into words — you could say that it didn’t take advantage of the medium of expression (literature). The story and the storytelling are not the same thing; you’ve only conveyed the facts of your story, but not the greatness of it. Of course, you know better. Let’s say instead, you write the book beautifully, creating the best novel of all time. Great job! Now, you have a new task: you must convey your great story as a movie. Now, let’s look at the medium of cinema. 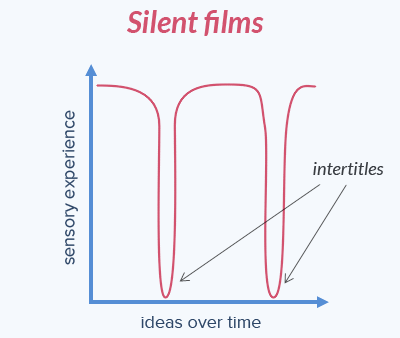 Whereas literature can be characterized by using words to present ideas over the course of time, cinema builds on that by adding a second dimension of expression: sensory input. The audiovisual experience in a film is a whole new realm of possibilities for artistic expression. Whole pages of descriptive language in a book can be represented by a brief scene of imagery in a movie. A conversation between characters is now enhanced by their body language, their tone of voice, and the cinematography. So, to make your movie, what do you do? Here’s one method: hand a random person your amazing, book version of the story, and film them reading it out loud. Perhaps you also sprinkle in some beautiful panoramic landscape shots. That counts as a movie, right? It’s got audio and visuals set to ideas presented over time. Well, despite containing narration of the best novel of all time, the movie is a failure. Again, it did not take advantage of the medium of expression — the visuals and the audio are not used in a way that brings the story to life. Anyone who viewed it would laugh at how it tried to tell a story with complete disregard of the entire sensory dimension of cinema. If you’re just going to watch a movie of a guy reading a book out loud, you might as well just read the book yourself. What about the beautiful, panoramic shots? They’re nice, but if you haven’t unified the narrative elements with the cinematic ones, then all they are is a distraction. The visuals and the audio are the primary vehicle for telling the story; they shouldn’t be treated as mere artifacts of the medium. The level of cinematic quality of the panoramic shots needs to be permeated throughout the whole storytelling; you can’t just segregate the story part and the video part. It’d be like trying to save that bad book we wrote earlier by sprinkling in Shakespeare quotes. You can’t just staple on pretty cinematics to a book and call it a film adaptation. Of course, again, you know better — this is all obvious stuff. Instead, you film an amazing movie. Good work! With that achievement out of the way, you have one final task: to tell your amazing story using a video game. We said that cinema was kind of like two-dimensional literature, the second axis being sensory input. Video games introduce a third-dimension: interactivity. In books, depth comes from the words you read; in film, additional nuances emerge from hearing and seeing a scene. In games, you can discover further depth from doing the scene. With interactivity, you now get to experience the story firsthand. When you play as the protagonist, you have the opportunity to take on their motivations and emotions. You hear and see things via your own discovery, not from the guiding lens of a cameraman. We could say that video games communicate depth of narrative experientially, whereas cinema did it visually. So, to adapt your story to a game, you do this: you take your amazing movie version of the story, cut it up into its individual scenes, and create a computer program that plays back the clips. You code some fun segments of gameplay that are tangentially related to some unimportant parts of the story, and then sprinkle them in between the movie scenes. Well, despite having the best story, the best writing, and the best cinematic representation of it, the game again fails to take advantage of the medium of expression — it did not integrate the interactivity into the narrative. What about the fun gameplay sections you sprinkled in? Well, just like the Shakespeare sprinkled in your bad book, and the panoramic shots in your bad movie, those gameplay sections don’t do anything to advance the narrative. All you’ve done is segregate the game into its story parts and gameplay parts. No matter how fun the gameplay part is, no matter how good the story part is, if there is minimal overlap between the two, then you can hardly say that the story was successfully told through the medium of games. All you’ve done is staple gameplay onto a movie. Now, people who play this game would laugh at how poorly the narrative is presented, right? Well, no, they wouldn’t. You may be unsurprised to learn that almost all big-budget games present their narrative in that method — story, gameplay, story, gameplay, with minimal overlap. Wait-a-minute: this method isn’t actually bad storytelling, is it? I mean, people love these games, don’t they? They sell well, and people always talk about how good their stories are. Well, yes, I would say that it is bad storytelling. Now, that isn’t to say that the games themselves are necessarily bad, or even that their stories are bad. Narrative isn’t automatically a crucial component in games, as it often is in film or literature. Interactivity is the defining feature of games — and indeed, games that excel in their gameplay are most often great games. However, a large number of games appear to have serious narrative ambitions, yet they try to tell their stories by jamming together the mismatching puzzle pieces of cinematic control and interactivity. It doesn’t matter how good your story is. What matters first is how good your storytelling is, and that’s defined by what medium you’re telling that story in, whether it’s a book, movie, or game. The aforementioned games with big narrative ambitions have great stories but bad storytelling. So what makes storytelling good, and how do we identify bad storytelling? Before we answer those questions, let’s all get on the same page regarding some concerns: Isn’t this all subjective? If everyone likes it, then what’s the big deal? Is the quality of game storytelling subjective? Only partially. A story-focused video game, like any form of creative expression, is an act of communication. The goal of a game designer is to communicate an experience and theme to the player. What’s subjective is the value of that desired experience and theme. However, what’s not as subjective is the effectiveness of the communication of those ideas. Most game criticism about stories tends to discuss the subjective themes, while taking the clarity and presentation of the theme for granted. It’s like if critics were discussing the horrible movie that we made earlier, and rating it positively solely because of the content of the narrated story, overlooking the fact that the story is presented in a horrible way. But people like these games; they have fun and they enjoy the stories. Well, I don’t mean to diminish their positive experiences. Rather, I hope to show that enormously greater experiences are possible. We have very low standards, mostly because there are such few good examples out there. This is reinforced by popular game journalism reviews, which really is just an extension of the game industry’s marketing arm, a symbiotic feel-good loop that ensures that only the most easily digestible game concepts are explored. We think what we want are movies with a dash of interactivity, when there is actually an entirely unexplored universe of possibilities out there. Once you think about what the theoretically perfect game narrative could be, you realize that what we currently have falls drastically short. We already have works in literature and cinema that are close to ideal perfection, but we don’t even know what the ideal is in games. The goal of this article is to show that games have barely even figured out how to present a theme, and that we should first focus on how to properly use the medium as a tool of expression before we start to worry so much about what is being expressed. Before we talk about storytelling, let’s first talk about how to even identify good qualities in a game. One of the strongest indicators of artistic quality or good design is how effectively the individual elements work together to communicate the theme. In a good movie, everything should work to reinforce the thematic ideas, from the colors and the angle of the camera, to the music, acting, and makeup. If one of these elements instead contradicts the theme, then it sticks out and detracts from the power of the message, or at the very least, misses an opportunity to strengthen the message. For example, in The Matrix, colors are used to emphasize the idea of opposing realities. All the scenes that take place in the simulated matrix world have a green tint built into the very props, wardrobe, and lighting, while all the scenes that take place in the cold and harsh real world have a blue tint. This visual cue helps the viewer subconsciously distinguish the contrasting worlds. It’s an elegant way to subtly reinforce that theme. If the color palettes were instead chosen arbitrarily, the theme of contrasting realities would be that much weaker, that much less coherent. A good cinematographer finds and takes these opportunities in order to maximize the strength of their ideas. Likewise, in game storytelling, we also find opportunities to reinforce the message of the story with game elements like interaction and decision making. To ignore the theme while designing these elements is to have a weaker storytelling experience. This is a restatement of our earlier revelation, that we must take advantage of the traits of the medium in order to effectively tell a story in that medium. A creative work made with this attitude feels elegant and consistent, because it manages to communicate many related ideas with few components. A less coordinated game instead feels unfocused, clumsy, and conflicting. If we want to identify weak storytelling, these are the attributes to look for, which we can detect by playing through a game and paying attention to see if our mind fills with dissonance. Cognitive dissonance — it’s an internal, mental conflict, and is usually quite subtle. It happens when you hold two conflicting beliefs or ideas in your mind at the same time. What kind of dissonance do we feel when we play these kinds of games? Here are three kinds that I’ve identified. Some games purposely exploit ludonarrative dissonance to their advantage. 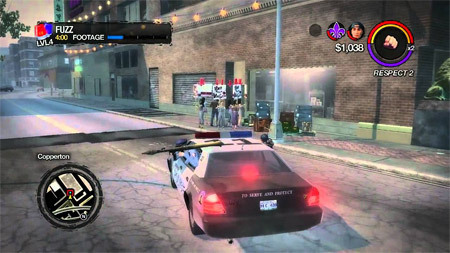 Saints Row 2 is a game with the humor built around that exploitation. For example, in one scene you mourn the loss of your friend’s wife, and then afterwards, you run around in the streets naked with a chainsaw, throwing grenades at civilians. Now, doing that may be funny on its own, but when done in the context of an ostensibly serious story, it’s hilarious in its absurdity. The first � and most apparent � kind is ludonarrative dissonance. What does that mean? Ludonarrative dissonance is when you watch a game cutscene where the hero laments his distancing relationship with his family, and then in the next moment, you’re driving a car over a hundred people. Ludonarrative dissonance is when a great warrior ally monologues about how cunning and fearsome he is, only in the next moment, he’s running in circles, blocking your path annoyingly, and then gets shot dead instantly. It’s when what the story says and what the player does or experiences don’t match up. This kind of dissonance happens quite often when you segregate the narrative and the gameplay, because the narrative is in the hands of the writer in one moment, and the player the next. It makes it hard to take seriously what the story is saying, because it conflicts with what we are actually experiencing. The next kind of dissonance is a dissonance of identity. To explain this, let’s first back up a bit to the analogy of literature, cinema, and games as dimensions. Another way to look at this triplet is in their increasingly intimate point of view. Think about books: a lot of literature could be described as third-person storytelling: the events are verbally recounted to you by a third party — the author — and you interpret the words on your own. Movies, on the other hand, are second-person storytelling: you watch the events unfold before your eyes, seeing things directly as they are. Lastly, video games are first-person storytelling: you are the actor living out the story. Instead of simply being told what’s going on, or watching it happen, you’re experiencing it firsthand! However, in poor game storytelling, we often have a big dissonance regarding your identity. In one moment, you are the protagonist, exploring the world and fighting enemies. In the next moment, you jump out of your body and watch your character interact with others without your control, walking and talking on their own. You’ve switched from first-person to second-person. Who are you? 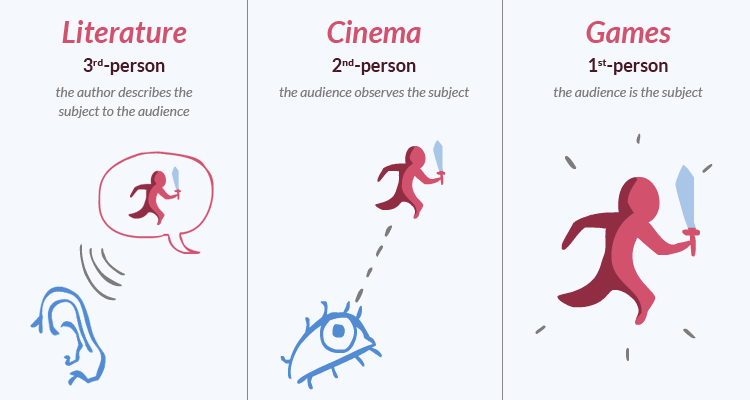 Are you the actor or the viewer? Games should be consistent with their point of view. It severely diminishes the importance of your actions if it constantly feels like the game distrusts you with making the important ones. It diminishes the importance of your actions if it feels like the game distrusts you with making the important ones. One of the basic principles in writing is to show, don’t tell. If you want to convey that a character is nimble, don’t explicitly say "Bob is nimble," show it: "Bob dodged the falling boulder." In games, the principle should be to do, don’t show. Don’t just show a cinematic of your character dodging a falling boulder, do it: have the player dodge the boulder himself. Now it is the player themselves who feels nimble, instead of just his avatar. This conversion of character development into personal development is the key to immersive storytelling in games. The last kind of dissonance is the weird modal shift that happens every time the game awkwardly tries to switch between "narrative mode" and "game mode". One minute you’re playing a game, the next you’re watching a movie. It breaks the immersion, reminding you constantly that you’re consuming a piece of media. Not only that, it strips away any tension and emotion that was built up during the gameplay. Imagine you’re playing an intense game where you’re fighting for your life. You’re in a really difficult segment: the whole time you’re on your toes and watching your every step, making sure you don’t make any mistakes. The stress and tension you are filled with is real: it’s genuine, tangible pressure, not just because your character is in a thematically tense situation with bullets flying and zombies shambling, but because you yourself are being challenged, trying to master the gameplay and pull victory out of a tricky situation. This part right here is good storytelling: the emotions the player is feeling matches up with the thematic situation at hand. Converting character development into personal development is the key to truly immersive storytelling. While you are playing through this part of the game, all of a sudden, the camera zooms out, and now it’s a cutscene. Instantly, all your internal tension is gone. You put your controller down and sit back and watch. Even though the characters on-screen might now be engaged in an even more thematically tense situation, jumping from helicopters or something, you as a player don’t really care about that. Deep down inside, you know it’s just "movie mode": anything that happens now is just supposed to happen; it’s all just "part of the story". Any mistakes you made before, during the gameplay mode, actually mattered: they caused you real world stress. But now, since you have no more control, any mistakes that you see your character doing during movie mode are all "part of the plan". You no longer have skin in the game. You find yourself relaxing when it switches to this mode. You’re relaxing during the climax! What’s supposed to be the most intense part of a game is now the moment for your to ease your muscles and take a breath of relief. The game wasted a hard-earned emotional buildup in the name of being more "cinematic"! Every time the game switches from gameplay mode to movie mode, your attachment to the player character switches from 100% emotionally invested, to 100% detached. That’s pure, jarring, dissonance right there. A pianist plays in front of an intertitle from the silent film, Hoodoo Ann (1916). Here’s another, very different example of this kind of modal shift, this one happening outside of games: silent movies. These films have pretty good cinematography and very good acting. You could say that they fill out the visual experience quite well. However, every once in a while, an intertitle comes up. Over the length of the film, it generally maintains high levels of visual experience; however, whenever an intertitle comes up, the amount of sensory experience drops down to near zero. The exact same thing happens with game cutscenes! 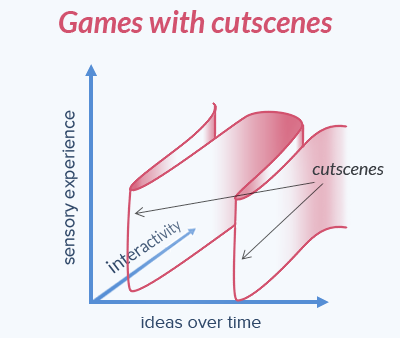 When a cutscene happens, you ignore the whole dimension of interactivity, the thing that makes games unique from film, and put straight up film on the screen. Games with cutscenes are the silent films of games. At least silent films are excused by their technical limitations — no comparable excuse exists for games. The worst part is that the most important plot points tend to happen during cutscenes, while keeping you at a safe distance from actually participating. Games with cutscenes are the silent films of games. Let’s look at a counter example to cutscenes. The Half-Life series has an alternative approach: instead of showing a movie, they unfold the content of the scene naturally during the gameplay, and you never lose control of your character. Characters start talking around you, impressive visuals happen in front of you, but you’re always in control. You may be confined to a gated area during these parts, but you’re still free to walk around and examine things, and watch the action unfold while remaining in-character. This works pretty well: the immersion is not broken, and you don’t change point-of-view — you never stop being an actor in the story experiencing things firsthand. It’s not perfect though: the formula does eventually get a little bit predictable, and the illusion wears away once you start realizing, "okay, I’m now in a story room," but for the most part it works well, far better than a cutscene. We’ve talked a lot about what games are doing wrong. How do we improve our storytelling? To figure that out, let’s first take a look at the concept of narrative itself more deeply. What even is narrative? Do all games have it? Do all games need it? Let’s lay down some definitions. First of all, there are two kinds of narratives in games: the first is the traditional kind, the kind we think of when we talk about plot, characters, and dialogue; and the second kind is the narrative of the player’s personal experience. The first kind is what I call the explicit story. It’s what games are about. This game is about fighting off zombies. This game is about exploring the world and saving the princess. This game is about saving the world from aliens. It’s the aesthetic context of the game, explicitly stated by visuals, sounds, and words. Not all games have this kind of narrative, but it’s in most. 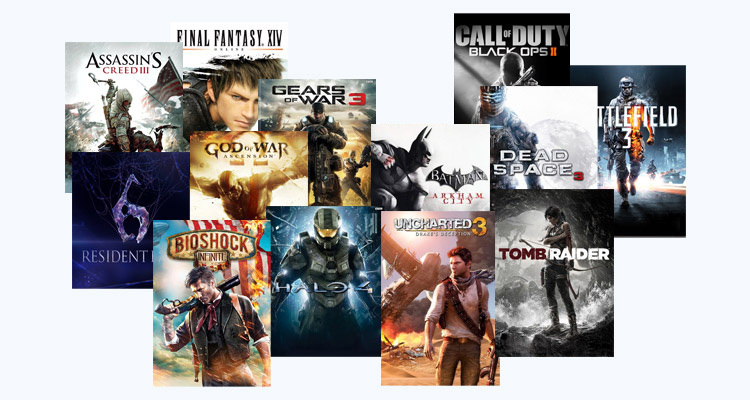 RPGs, adventure games, and action games usually put a lot of emphasis on the explicit story. Other games eschew it completely, like many puzzle games and most traditional card games. Even a game like chess has a tiny amount of it: the game is loosely styled as a medieval war game. The second kind of narrative is what I call the player story. It’s the player’s personal experience. As they play through the game, a lot of things happen in the player’s mind: they experience a variety of emotions, they develop perceptions and interpretations of characters and events, and they form relationships between their own actions and the on-screen results. These things all work together to create a different kind of narrative experience, one with its own pacing, characters, plot, and dialogue, separate from the explicit story. Are these player stories actually real stories? Yes — in fact, players will often just outright tell these stories to others. Ask someone about their intense Tetris match. That’s a real story. Maybe it doesn’t sound that exciting when you put it in words, but in the player’s mind, it’s a fully developed experience with a real conflict, climax, and conclusion. It’s felt deeply by the player, because it’s something that happened directly to them. All games have this kind of narrative. Even a game like football has its own stories — people tell them all the time, recounting exciting matches and plays. Many games have both kinds, both an explicit story and the player’s story. However, a good player story should always be the end goal, while the role of an explicit story should be to support the development of a good player story. A game with an amazing explicit story and a horrible player story is like the book we made earlier that had a great plot but a horrible delivery of it; it’s the movie we made with the bad narrator and boring visuals. You can’t just design both stories separately: as we saw earlier, fun gameplay that is segregated from the explicit story makes for dissonance, meaning you’ll end up with a disjointed and bad player story. So how do we tell a good player story and a good explicit story together? By knowing this: the best game storytelling is when the explicit story is indistinguishable from the player story. Ideally, when you play a game, you should never have to ask yourself, "What am I supposed to be doing?" In a good game, what you are supposed to do should intersect with what you want to do. If the emotions and motivations you feel while playing a game feel natural within the context of the game, then something amazing has happened. In a good game, what you are supposed to do should intersect with what you want to do. Here’s an example from the first Portal game. In this game, you play as a test subject with a portal gun, trying to advance through different test chambers. Near the end, you are riding a slowly moving platform to what you are told is a reward for your good test performance. Suddenly, it’s revealed that the platform is actually taking you to a fiery death. When I was playing this scene, I genuinely panicked: I was deeply immersed in the game at this point, feeling good about myself for beating the puzzles, ready to be rewarded for it, and now I was being betrayed. Without thinking, my eyes lead me to an ideal surface for firing my portal gun, and I created an exit for myself, escaping certain death. For just a moment, I genuinely thought I broke the system. I had outsmarted the enemy with my wits! Now of course, it turns out that I was actually supposed to do that. But when I did it, it was purely out of my own motivation for self preservation, not because I wanted to "advance the story". There’s a night and day difference between just watching a character narrowly escape, versus doing it firsthand via your own wits and finesse, experiencing genuine anxiety and relief. A key plot element has progressed naturally, without dissonance. What I wanted to do and what I was supposed to do was the same. Everything in the earlier parts of the game worked towards making this scene happen naturally for the player: the training in the portal mechanics; the witty dialogue that foreshadowed doom; the test chamber format that made you want to escape; the little hints that escape could be possible. Let’s break this scene down to the two narrative types: The player story is that you used your wits to escape a stressful situation. The explicit story is that your character, Chell, used her wits to escape a stressful situation. They’re identical! Let’s compare this scene to a similar one in a different game. I’ll use the new Tomb Raider as an example, although there are countless situations in other games that play out the same way. In one scene, you are watching a cutscene of your character running from danger, and suddenly it’s revealed that a large boulder is about to crush you. You have exactly one option: press the × button within the next half second. If you do, your character jumps out of the way safely. Any other action causes your character to die. On the outside, both scenes in Portal and Tomb Raider seem to have the same amount of danger: in both cases, failure means a gruesome death for the heroine. Yet in Tomb Raider, the situation is experienced largely emotionlessly by the player. Perhaps you cringe a bit when you see the grisly death animation, or maybe you experience frustration as you miss the button the first few times. But there’s never the excitement of using your wits to save yourself from danger, as there was in Portal. Even though the Tomb Raider scene may be more cinematic and visually impressive, it’s forgettable. You almost got killed! Shouldn’t that be memorable? It’s not, because the player story clashes with the explicit story. The player story is that you’re watching a cutscene, and suddenly the game tells you to press a button in an obvious and annoying way, and you are forced to press it under the punishment of boring repetition. The explicit story is that your character, Lara Croft, narrowly escape grave danger using her keen senses and agility. That’s a huge disconnect between the two! How dissonant is that? This is what I mean when I say that the explicit story is the aesthetic context to the player story. It’s a way of framing your actions and motivations, a way to increase consistency and to reinforce themes. The two narrative types work together. If there was no explicit story in that Portal scene, you would just be jumping from gray boxes into gray walls, so that you don’t fall into the red zone that would reset your position. You might feel good about figuring out the puzzle, or enjoy that you’re getting pretty good at the mechanics, but you wouldn’t feel like you "beat the system", or that you used your wits to cheat death. On the other hand, if there were no player story, like if you had just watched a really cinematic video of the situation, you wouldn’t have felt those things either. You may get excited by the visuals, or feel happy that the protagonist survived, but you wouldn’t feel any personal achievement or any risk to yourself. So we just saw a good example of how tell a good story of a short action sequence. How can we extend these principles to the entire story of the game? Well, it’s hard. Not many games have pulled it off very well, especially games with a linear, scripted, cinematic format. By this format, I mean games with a big emphasis on the explicit story, with scripted events, lots of characters and dialogue, and usually a definite ending. There are a lot of weaknesses with this format: a lack of choice; an over-emphasis of dialogue, even though the player has little control over it; a rigid, linear progression. These aren’t weaknesses in a film, but in a game, these traits clash quite heavily with the medium’s emphasis on interactivity. Portal is one of these games, but it manages to do a great job at storytelling. However, I think it is an exception, in that it is unique in its ability to take advantage of those weaknesses. The lack of choices, the one-sided dialogue, and the linear progression, all made sense in Portal’s test chamber format. You’re forced to do what is told, since you’re just a guinea pig; you can’t talk back, since there are no other characters except for a disembodied computer; and you only have one direction to go in those test chambers. This convenient format means that none of the usual dissonances arise. But you can’t really generalize these techniques to other games. It’s as if the only way to overcome these weaknesses is by embracing them and building them into the story itself. That’s not an option for most game stories. Maybe the linear, scripted, cinematic story just isn’t a great format for games. Some games with this format do a pretty decent job, at least in some aspects, but I doubt we’re going to see great advances in this style for a long time. It’s a style that is imperfectly adapted from movies, and it just doesn’t fit very elegantly in a medium about interactivity, choices, and personal experience. I don’t think it should be the go-to format for game stories. What other formats are there? There are a few options, many of them experimental, but there’s one in particular I want to explore in this article: emergent narrative. We saw that the weaknesses with the linear, scripted, cinematic format all revolved around control. The writer in us wants to create a string of concrete events that unfold unvaryingly, but what if we loosened up on that desire? What if we gave up that strict control? A common thing we saw in those games is that they first created the explicit story, and then designed the player story around that. They have their script all written out, and then built the gameplay with the script in mind, trying to get it to match up. What if we did the opposite? What if we designed the player story first, and then built the explicit story to match that? Now, I don’t mean to simply make a fun abstract game first, and then write a scripted story that makes sense with it. That’s certainly a great method to try out, but it’s not exactly what I’m talking about at the moment. What I mean is, instead of having any scripted elements at all, we let the explicit story describe the player story. We let the plot, climax, and characters all emerge from what the player experiences. In short, the story describes what the player did, instead of what the player needs to do. What would that look like, exactly? Here are a few examples. The first example is the game Journey. In the game, the explicit story appears to be very loose. When you start out, all you know is that you’re some sort of person or creature in the desert. That’s it. There are no explicit goals, motivations, plot, conflict or dialogue. However, these things naturally emerge, simply through the design of the game. Early on, you see a beautiful, gleaming beam of light on a mountain far in the distance. Either consciously or subconsciously, your goal becomes to get to that mountain, as it always seems to be in your view. Along the way, you encounter some characters. These are other human players, going through the same experience as you. You can’t talk to them with words, but you can communicate with body language and a singing ability. At this point, the story is different for everyone. Some people partner up with a curious new player, solving problems together, building up their friendship, reaching the end together. Others have conflicts with the other players, and choose to go it alone. Others make a great friend, but become separated from each other through their own struggles in the game, and they mourn the loss of their friend. Others find a mentor, an experienced player who can guide and teach them along their way. You’re alone in the wilderness, and then you get stuck at the bottom of a cliff. You have great trouble getting out, but then a stranger comes out of nowhere and helps you. The two of you become great friends and you explore the world together. However, as you cross a windy bridge, your friend falls off! You yell for him, hoping he hears you. You are filled with despair, knowing you may never see him again, but suddenly you hear him wailing faintly in the distance. You know that voice, that singsong pattern that you’ve heard him chirp before. Eventually, you go down and rescue him, as he had rescued you earlier. You journey to the end together safely. That’s like something out of a movie! However, the experience is even stronger than a movie, because it actually happens to you. It happens not because a writer decided it should, but because of the actions you and your new friend did. You formed real relationships, felt real emotions, real despair and joy. A scripted version of the experience would only be a vicarious one; never a genuine, firsthand one like it is now. You could call it a literal narrative, since everything that’s important actually happens in real life, short of physically going into a mystical desert. It’s not that the designers didn’t design any explicit story. Rather, instead of trying to come up with very specific plot lines, characters, dialogue, and events, they chose to design a context that would highlight those elements when they emerged. When you find another player, there are visual cues that underscore their presence and introduction. When you communicate with them through singing and body language, all sorts of imagery forms in your mind about the other player’s personality (that’s character development!). When you both are getting along fine, a big hazard tests your relationship. These are all elements of a great story, and they are explicitly designed by the designers. They’re just not shoved down your throat — they happen naturally. Let’s look at another example. We talked about letting the story emerge out of the player experience; this game takes that concept to a whole new level: Dwarf Fortress. It’s hard to describe Dwarf Fortress, but in short, it’s a detailed simulation of a kingdom of dwarves. It looks graphically primitive, but don’t let that fool you: the game is ridiculously detailed. This is a game that simulates everything from rivers cutting through canyons over thousands of years, to an individual droplet of rain on the eyelash of a child. It’s a sandbox game, and you try to build up your kingdom until a catastrophe naturally emerges through the complexity of the simulation, wiping everything away. One great aspect of the game is that its visual simplicity allows your mind to fill in the blanks and assign meaning and motivation to the details in the game. It’s like how when you read a good book, your mind naturally creates what the characters look and sound like. Through this and through the game’s complexity, you can imagine what kinds of stories must emerge. DFstories.com catalogues many of these: some filled with action, some unexpectedly heartfelt and touching, others just plain silly. Check them out to see just what kind of imagination and emotions get stirred up by people playing this game. While I would consider Dwarf Fortress to be on the extreme side of its style of storytelling, as it is quite inaccessible to most people, there’s still a lot from it that we can learn. The main thing we can take away is that an emergent situation — whether it came from the interaction of complex rules, the player’s experimentation, or even just through random chance — can be just as impactful to a player as a scripted situation, sometimes even more so. The beauty comes when the situations feel purposeful and add depth to the player story. The fact that a situation is emergent means it’s likely unique, making the experience feel special for the player, since they know that no one else has encountered it before. It’s like when you play Minecraft the first few times and find a beautiful natural formation. You feel a sense of awe, knowing that you’re the first person to have ever seen it. It must be what old explorers felt when trailblazing. That’s a hard feeling to create with scripted situations! A final example of emergent narrative is a roguelike game called Brogue. In Brogue, you are an adventurer exploring a procedurally generated cave, trying to reach the artifact at the bottom and bring it back up in one piece. It’s very difficult: death is permanent, and there are an infinite number of mistakes to make. The explicit story is minimal: all you know is what you’re looking for, and that the world around you is highly dangerous. Like Dwarf Fortress, the minimal visuals let the player form their own interpretations of the action. There he was, stuck on a wooden bridge over a deep chasm, goblins closing in on both sides, blocking the bridge exits. He is at low health and can't fight them all. All he has is an unidentified potion, which he can only hope is a potion of levitation, so he can fly off the bridge to safety. With the goblins just steps away, he drinks the potion. Unfortunately, it was a potion of incineration! A huge burst of flames erupts, setting him, the goblins, and the bridge on fire. The bridge burns away and everyone falls into the chasm below. Fortunately, he lands safely in a pool of water, which also puts out the flames. Some of the goblins survive, while others hit the ground nearby and die. However, one of the flaming goblins lands in a bog filled with explosive gas, and triggers a massive explosion that wipes out the remaining goblins. My friend escapes, and continues his journey deeper into the cave. That scene is packed with action. It’s just as exciting as any action movie or game cinematic, and it’s just one of many equally amazing scenes that I’ve seen happen in the game. Despite that, none of it is scripted; it’s not even directly intended by the designer. It simply emerges from the interactions of the mechanics. The difficulty progression in Brogue means that as you get further in the game, the more elements you’ll encounter, meaning more interactions and more intense sequences like these will happen. A playthrough of Brogue truly does contain a genuine story: the story of the player’s adventure through the dangerous caves. Just because there aren’t names or dialogue or cinematics doesn’t make it any less of a story. I honestly think the storytelling in Brogue, despite the game being entirely untouched by plot writers, is superior to the storytelling in a game like the new Tomb Raider. Yes, Tomb Raider has a more complex plot and more detailed characters, but remember: the story and the telling of it are not the same thing. Perhaps Tomb Raider would make for a better movie than Brogue, but we’re talking about games. Tomb Raider is that book we wrote at the beginning of this talk that has a good story but uses words and sentences poorly. Brogue is like Hemingway, with a simple plot, simple vocabulary, and simple sentence structures, but is written masterfully, in a way that deeply communicates its themes. I think the themes of action and adventure resonate much more deeply in Brogue than in Tomb Raider. Emergent narrative is still a fairly unexplored technique, one that I think is particularly promising, since it delves so deeply into forming personal experiences. It’s one of many possible storytelling methods, and I think designers will have to first branch out in these areas if we want to discover the ideal form of game narrative. Until then, let’s remember to focus on the player story when building the explicit one. Video games are a young medium of creative expression. Books have been around for millennia; cinema for a century. Video games became popular only just a few decades ago. We’re still just passing over the silent film era of games. I don’t think we’ve fully understood yet what it means to have great narrative in games, so we need to be open minded about different storytelling formats. We should stop looking to cinema as inspiration for our narrative, and start realizing that nontraditional structures can be a stronger storytelling technique than the ones in the biggest scripted and cinematic games. Let’s redefine game narrative to mean more than just plot and dialogue — what we really care about is the story that happens in the player’s mind.